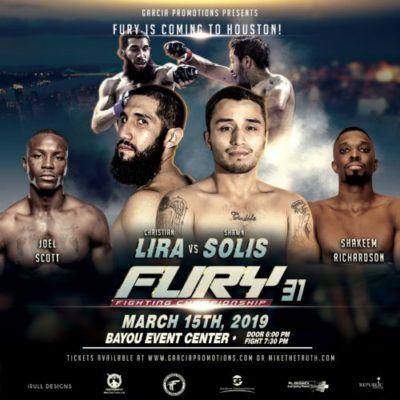 Fury Fighting Championship heads inside the Houston city limits for the first time, for Fury FC 31. The event takes on Friday, March 15, and will be held at the Bayou City Event Center. In the main event, we have a flyweight runback between Christian Lira and Shawn Solis. Lira defeated Solis via decision at Fury FC 21 back in 2017. Now, 2 years later, Solis looks to even the series. Co-headlining the card, Shakeem Richardson will face Joel Scott. Both fighters are coming off solid wins in their last outings, and stylistically, this will be a fun fight. Check out the rest of the card below, which is scheduled to include three amateur title fights. Make sure to purchase your Fury FC 31 tickets here at MikeTheTruth.com. Fighters receive a percentage of their ticket sales through my site. Will guardiola vs guerrero be live streamed on YouTube?